Some of my early relatives were called �wolf-chows�. They were selectively bred with Samoyed types to develop my breed as it is known today. I am a real people dog, being devoted to my people family and their children. My coat is thick and fluffy, so it requires brushing so that I will be pretty and clean and be allowed to stay indoors with my people, which is what I prefer to do. I like exercise, but I don�t have to have a farm to run around on. A nice brisk walk every day keeps me healthy and happy. When fully grown, I am between 19 and 24 inches tall (48.3 to 61 centimeters) and I weigh between 40 and 70 pounds (18 to 31.5 kilograms). We have no Eurasier Breeders listed at this time. 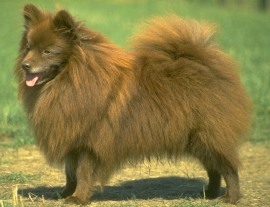 Click here to place your Eurasier Ad!